Heat a heavy-bottomed frying pan over a high heat, then add 2mm of olive oil and heat until it is smoking hot. It is vital that the pan is extremely hot before adding the steaks. Remove the steaks from the fridge. Season them with a little salt and place them in the smoking-hot pan for 15-20 seconds. Then turn the steaks over and fry for a further 15-20 seconds. Repeat this, turning the steaks for 2½ minutes. Remove from the pan and allow to rest on a cake rack set over a plate to catch the juices. In the meantime, remove the pan from the heat and discard most of the used oil (but don’t clean the pan). Allow the pan to cool for 2 minutes, then add the 100% Italian olive oil to the pan. Bash the garlic with the palm of your hand or the side of a knife and add it to the oil. Add 4-6 rosemary sprigs. Rub the strips of lemon zest between your finger and thumb to release the oils and add them to the pan, too. Allow to infuse for 5 minutes while the meat is resting, then squeeze in the lemon juice. Strain the dressing through a sieve and add any juices that have come from the steak. Slice the steaks thinly (0.5cm wide) with a sharp knife. Season with table salt and black pepper and place on the serving dish. Spoon over half the dressing. Season the rocket leaves with salt and mix with the remaining dressing. 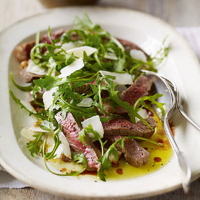 Place the rocket leaves on the beef and finish with the Parmesan flakes and a sprinkling of sea salt crystals.